What allows kids to use a lot of energy, make funny noises, relax, and learn to focus all at the same time? Yoga! 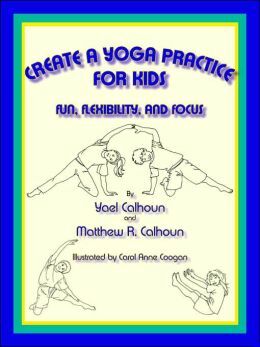 While many yoga books present individual poses, this book explains how to create a flowing yoga practice that will holds kids' interest while providing the benefits of yoga. Create a Yoga Practice for Kids is a handbook for anyone--including parents, teachers, and kids--who wants to develop a fun yoga practice. In addition, the book provides ideas for yoga games, yoga at a wall, more relaxation games, and five-minute classroom yoga. Yael Calhoun, M.Ed., M.S., is an author and educator who has been studying yoga for 15 years. Yael lives in Utah with her husband and three sons, who have shared their yoga practices with her from the start. Matthew R. Calhoun is a certified children’s yoga teacher and holds three certifications in hypnotherapy. He created yoga programs for children at the Chicago Yoga Institute and at Onward Neighborhood House. Matthew lives in New York City.